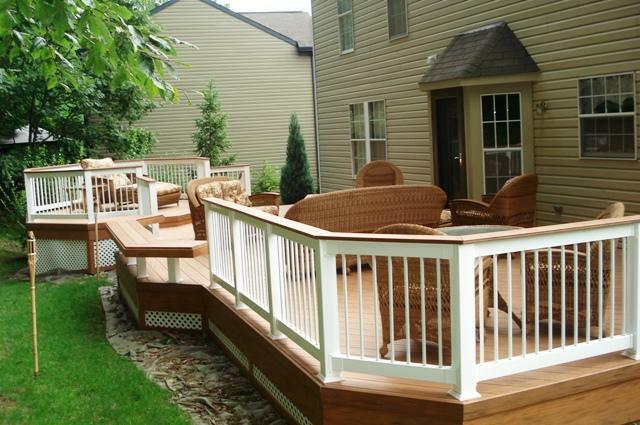 Multi-level decks as well as deck and patio combinations are the growing trend in the Columbus, OH market. Archadeck of Columbus gives you some wonderful examples of the different combinations, with function and beauty in mind. 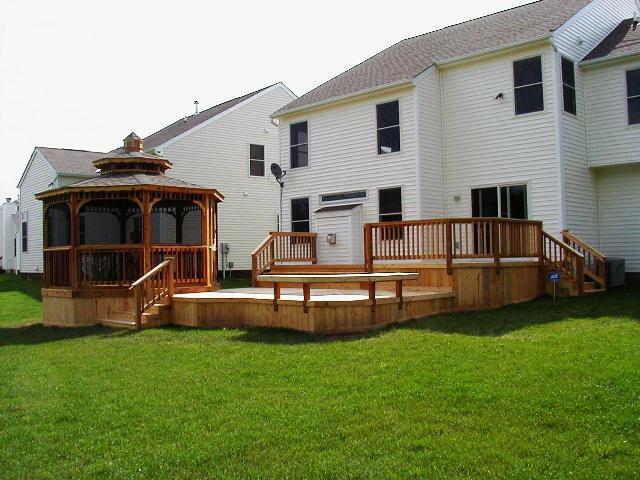 Here at Archadeck of Columbus the growing trend we continue to see among our customers is multi-level structures such as multi-level decks and decks that step down to patios and landscaping. Not only are these structures pleasing to the eye on multiple levels but they are built with multiple ways to enjoy your structure. Bi-leveled structures maintain room for a multitude of uses some of which would include separate dining, separate gathering areas and separate seating areas. Most homeowners usually have a deck or patio only. By utilizing a combination of both of these structures you will not only have two distinct living areas, but you will also have multiple outdoor living areas which is unique. In today’s markets having the “unique” will enhance your investment in your outdoor living structure. A classic example, and one most homeowners can relate to, is the scenario of the backyard dinner party where the men and women usually end up congregating in separate spots on your single level deck or patio. The added space and separation a multi-level structure provides would give your male and female guests alike room to stretch out and enjoy their evening . You could even heat things up a little by adding a fire pit to create a distinct area. One level could make room for seating and dining and the other could be seating and the fire pit area. Another unique and aesthetically pleasing option is a gazebo or pergola added to one the levels in your your multi-level structure. Not only are these structures stunning to look at but they add shade to your space. Structures such as these would allow for shelter from the elements as well, so even if a summer shower comes to ruin your backyard barbecue your guests can move under the covered structure portion of your structure until the rain passes. Multi-level structures are common in the Columbus area because of our terrain. The average home is about 30″ off the ground so it makes a perfect place to have two distinct areas. 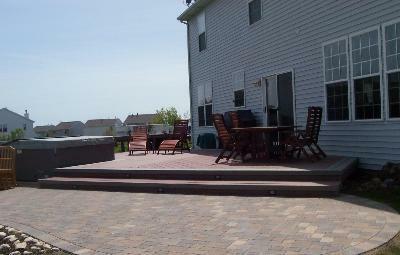 Low-to-grade decks are still a popular choice in this area as well. 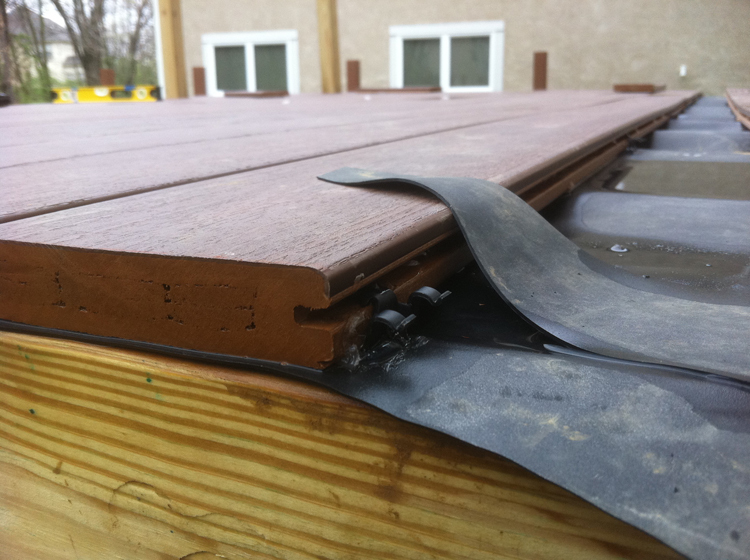 The beauty part of a low-to-grade deck is the option of not requiring a rail. Structures less than 30″ off the ground do not require a rail by code. advantages of not having a rail are the ability to see an un-obstructed view of landscaping, or hardscaping, or other focal point in your landscape, as well as the additional room you will have to add seating, furniture or planters. A clear uninhibited view is appreciated by many homeowners. If you have a relatively flat grade to your yard hardscapes such as patios are easier to construct. There are two things about being close to ground-level that we want to caution homeowners about. If the grade is extremely low the structure will require more posts to structure because you can’t use a beam construction. We use a true post and beam construction but with low to grade structures the posts are actually attached to joists which eliminate the beam. The second concern is the moisture and ventilation issue. 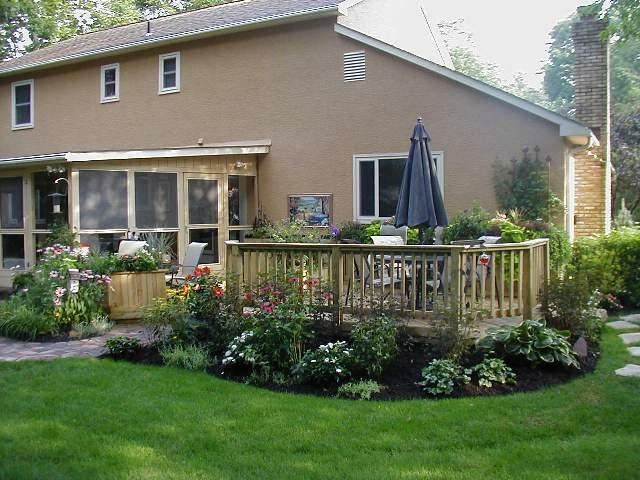 Most communities require landscape fabric with gravel be put down to avoid grass and weed growth into the deck. This barrier also inhibits animals and helps keep it drier. 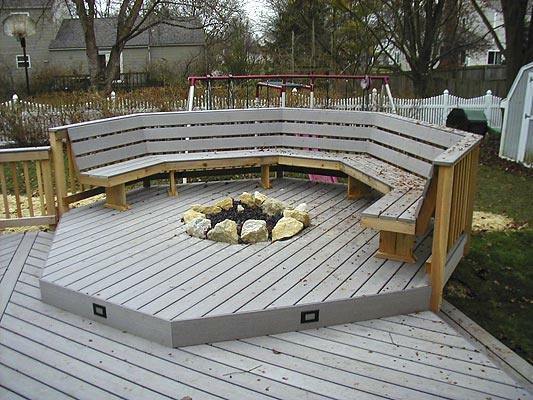 Archadeck of Columbus recommends being no less than 16″ off the ground to alleviate structural costs and ventilation issues. If you are considering a multi-level deck or deck and patio multi-level combination, or one of many other unique combinations, give Archadeck of Columbus a call to discuss what type of structure is best for you. We can schedule a free consultation to evaluate which grade would best suit your lot and design and construct the structure of your dreams. Archadeck of Columbus tells a nightmarish tale of construction pitfalls to warn other homeowners of the dangers of not hiring a professional contractor. Once upon a time a homeowner hired a contractor to do a TimberTech installation at his residence. Before the job even got off the ground the homeowner realized there were a lot of things awry with the job.First of all, the contractor he hired did not obtain a proper permit. By law a building permit for any structure, or addition is to be posted in clear view at the job site. It is also crucial to make sure the contractor has proper liability insurance, you can indemnify them by adding their name on it. The contractor did other bad deeds as well, such as putting rubber membrane underneath the decking boards, so it was between the decking boards and the joists. The contractor then screwed the decking down through the membrane. The screws and nails they used for the job were not supposed to be used for exterior applications, so in a short time, the nails they used for the framing would have deteriorated when used in combination to the treated pine joists. 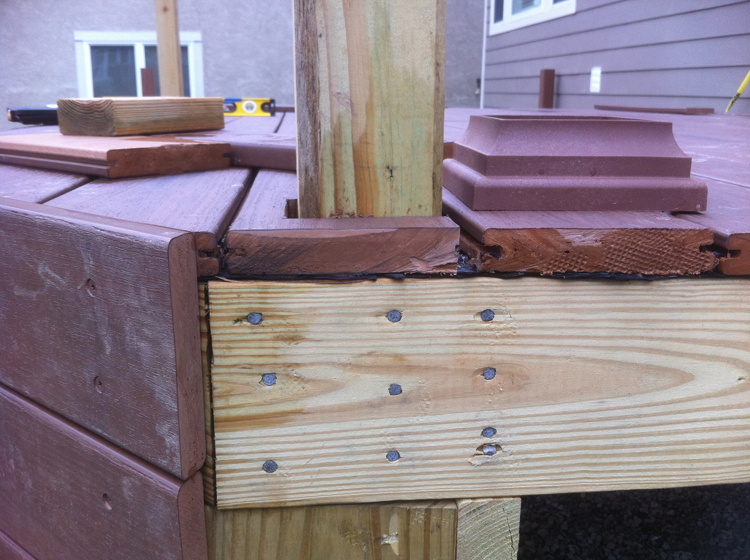 Also, the hidden fasteners used were not the proper TimberTech fastener system. This particular contractor, did such a horrendous job, A video showing the deflection of the boards when you pushed on the boards was made. We made the video to warn other homeowners of the potential hazards and pitfalls of not hiring a professional contractor. There is no way to do enough research to understand what the contractor is doing wrong or the requirements for each job. This is the beauty of hiring a professional, we have knowledge of the products, the requirements and we build quality into every inch of our structures. We call it ” the Archadeck difference”. With almost all synthetic decking, such as TimberTech, it requires that you run your joists at a minimum of 16″ on center when you run the decking perpendicular. 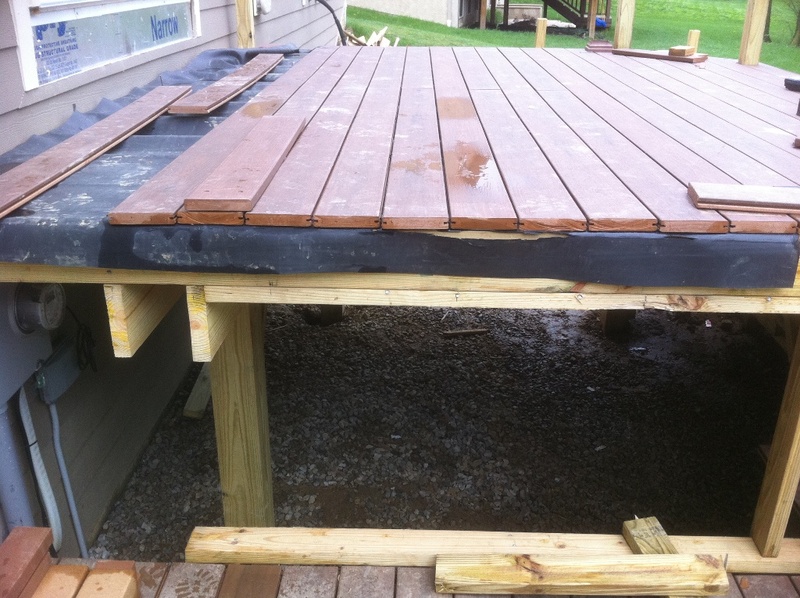 If you run the decking on a diagonal it needs to be a minimum of 12″ on center. We always make sure the joists are 12″ on center. It is crucial with any synthetic decking that the contractor follows the installation instructions by the board manufacturer. This story did end on a happy note, the very distressed homeowner called TimberTech. TimberTech gave the homeowners our name and told him to call Archadeck of Columbus because of our prior knowledge, experience and expertise of working with the TimberTech products. Archadeck of Columbus is completely re-doing the job, the way it should have been done to begin with. We asked the homeowner how they found the bad contractor. 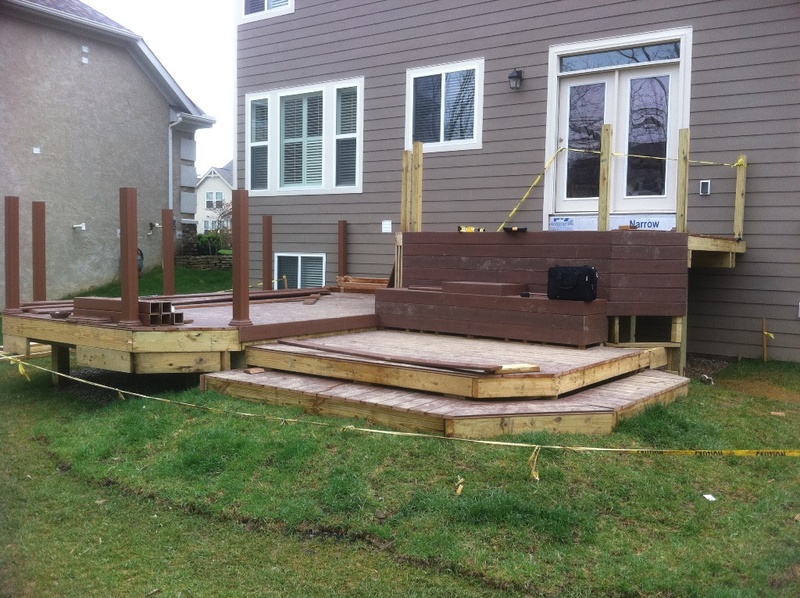 They indicated that their neighbors had a deck built by the other contractor. So, we went next door to see if the contractor did the same thing at the neighbor’s house. Take a look.